You Watch One Piece episode 512 online English sub free episodes with HQ / high quality. Stream Anime One Piece episode 512 English Subbed With Hopes It Will Reach My Friends! Big News Spreading Fast! Buggy tearfully reunites with his crew on an unknown island. Alvida discovers a treasure mark from which Luffy found in Impel Down. Mr. 3 delivers a message from the World Government to Buggy. At the Sabaody Archipelago, Duval and the Flying Fish Riders confront the Copper Pirates. 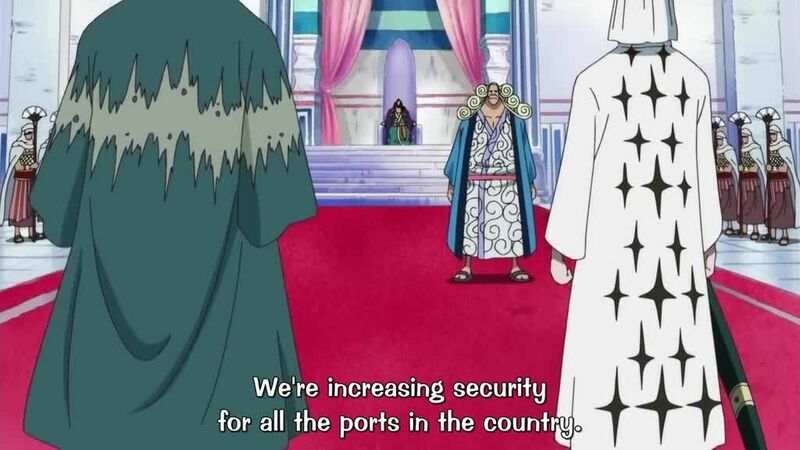 Shakky, Camie, Hatchan and Pappag entrust the protection of the ship to Duval. Eventually, the pirates confront Kuma and the World Government. At Alabasta, Cobra, Chaka and Koza learn they have problems with the pirates. However, Igaram tells them that Vivi and Karoo were excited that Luffy has survived. On another unknown island, Crocodile and Mr. 1 read the news on Luffy’s involvement, and decide to return to the New World. Chopper flies on a bird when he receives Luffy’s message. Robin travels to the East Blue and receives Luffy’s message. On Kamabakka Kingdom, Sanji and Ivankov receive the news on Luffy’s involvement. Usopp tries to escape Bowin Island when he and Heracles receive the news. On Weatheria, Nami and Haredas receives Luffy’s message while trying to escape. Franky, having survived the explosion at Karakuri Island, also receives the news. Brook is caged by the local tribes when he receives the news. On Kuraigana Island, Zoro and Perona eventually learn about Luffy’s message.